Zhinan Temple in the Wenshan District is one of the main religious institutions in Zhinan. The name "Zhinan Temple" includes two important meanings: 1. that the god, Lu Enzhu resides at the Southern ("nan") temple in the Heavenly Court; and 2. that in order to determine who on Earth needs help, he uses a compass ("zhinan"). In the same area, there is also Fude Temple, dedicated to the land god. In front of the temple, there is Qixing (Seven Stars) Pond, which was designed according to fengshui principles and also serves as a receptacle for believers to place their monetary contributions. Taking the stone steps, it is possible to reach Zhinan Temple Corridor, as well as see the entire Muzha tea farm landscape. This temple is known to foreigners as "the Temple of a Thousand Steps." This is no exaggeration--there are actually around 1,200 stone steps up to the temple--and there is a saying, "live an extra 20 seconds for each step you climb." If this is true, you can add more than six hours to your life by climbing all of the steps. The main deity in this temple is Lu Tunpin, one of the Eight Immortals of Chinese legends. He is a well-loved deity, despite a reputation for somewhat randy behavior. He is said to return frequently to the mortal world to bring salvation to the faithful. 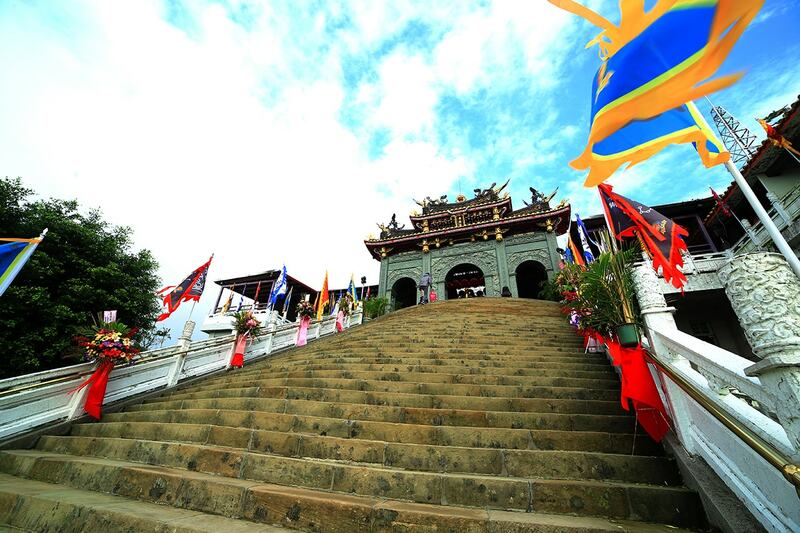 Zhinan Temple sits on Monkey Mountain and, in addition to the steps, is accessible by a paved road. But the stone steps are worth a trip in themselves; they are flanked by rows of stone posts topped by stone lanterns that were donated by devotees during the period of Japanese occupation (1895-1945). Nat'l Hwy 3 → Muzha Interchange → Nat'l Hwy 3A → Wanfang Interchange → Sec. 4, Muzha Rd. → Wanshou Bridge → Sec. 2, Xiuming Rd. → Wanshou Rd. Take THSR or train to Taipei Station, transfer Taipei MRT to Taipei Zoo Station, take Maokong Gondola to Zhinan Temple Station. Take THSR or train to Taipei Station, transfer Taipei MRT to Wanfang Community Station, take Taipei City Bus ( No. Small 10) to Zhinan Temple Station.